Go to ‘Settings’. Open the left hand navigation window, and click the gear icon next to your user name at the bottom of the menu. Click ‘Settings’. Click on ‘Advanced Settings’. It’s the blue button in the top right. Choose your authentication method and configure domain signup. Password: When ‘password’ is chosen as the authentication method, a new user will be prompted to create a unique password to sign on to their Sigma account. SAML: When you set up SAML authentication, user accounts will be authenticated utilizing the single sign on protocol you provide. 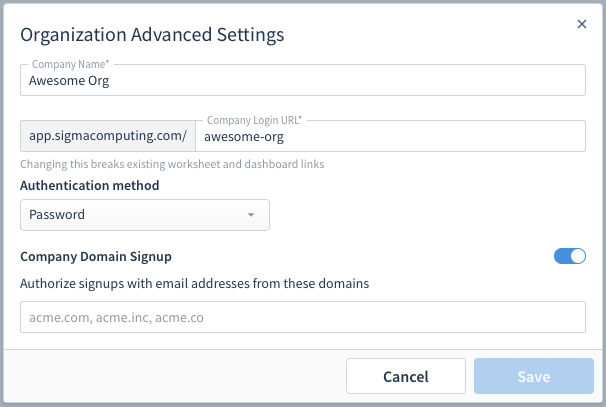 Learn how to setup single sign on. When you have ‘Password’ chosen as the authentication method, you can also choose if you would like to whitelist any domains. By default, new users can only sign up via invite. Whitelisting your company email domain will allow anyone with a company email to create a Sigma account without need a personalized invite. New users will be prompted to enter their email from the whitelisted domains. Once the email is confirmed, they will be able to register as a Sigma user.